Be sure you know who's treating your lawn! The air is getting crisp, the days are getting short, and the leaves have begun to fall! 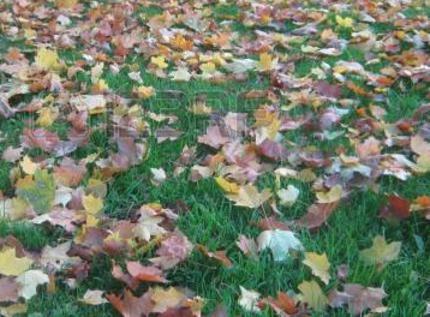 Although its a good idea to keep your lawn as free of leaves as possible for the overall health of the turf, lawns do not need to be completely free of leaves in order for us to properly fertilize. As long as we can still see grass blades through the leaf cover, the application will be perfectly effective. This is possible because leaves are light and easily carried by air currents while fertilizer prills are dense and tend to stay put even when mowers, blowers, and winds are involved. Most fertilizer prills quickly roll or bounce off of leaves during the application and any prills that end up on leaves are quickly rolled off and onto the ground when the leaves are disturbed. So clean up those leaves to allow the fall sunshine get to the grass, but not worries about the fertilizer not getting through those leaves.